Animals. Who doesn't love them? They're one of the first things we learn to love as children. We want them as pets. We see them in farms. And we take trips to the zoo to see them. They are marvelous and intelligent and, sometimes, even dangerous. But we think we know all about them. Don't we? Wrong. There are thousands of different animals classified in hundreds of different species. It is impossible to know all of them. 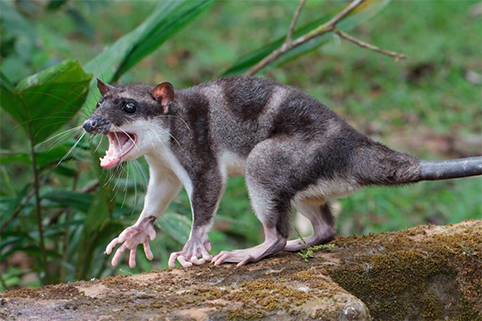 Some animals you didn't even know existed. 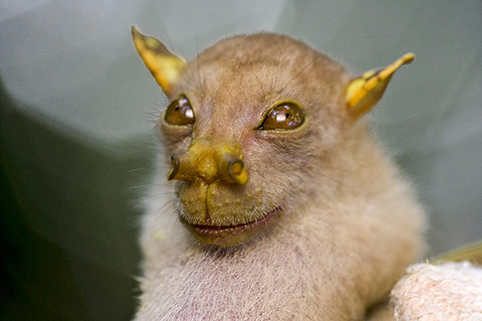 So, here, I have for you 50 of the weirdest animals you probably didn't know existed. 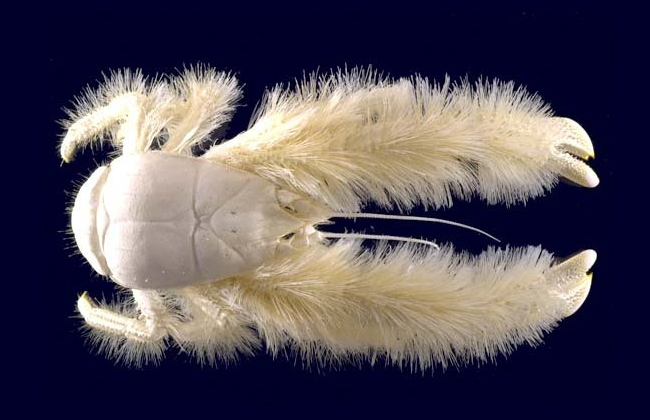 The yeti crab (Kiwa Hirsuta) is an unusual, hairy crab with no eyes. It was discovered in 2005 on a hydrothermal vent near Easter Island. It is notable for the quantity of silky blond "fur" covering its legs. The Indian flap shell turtle (Lissemys Punctata) is a freshwater species of turtle found in South Asia. 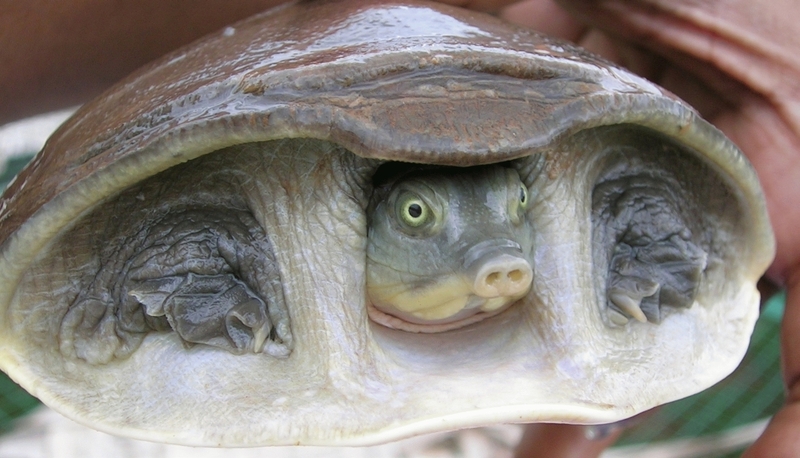 The "Flap-shelled" name stems from flaps of skin that cover the limbs when they retract into the shell. 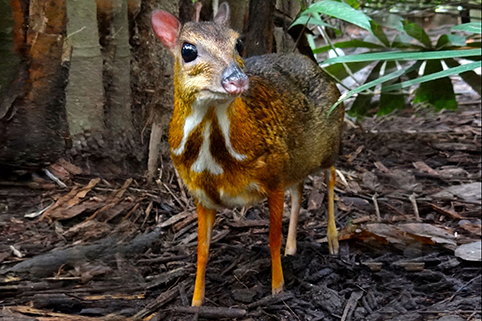 Chevrotains, also known as mouse-deer, are small animals found in forests in South and Southeast Asia, with a single species in the rainforests of Central and West Africa. They are solitary or live in pairs, and feed almost exclusively on plant material. 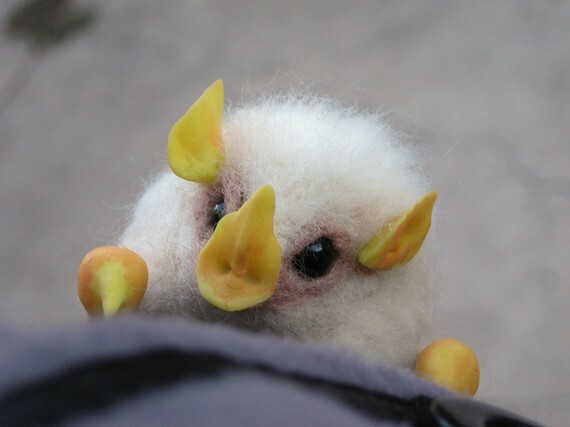 The Honduran white bat (Ectophylla alba) is a species of bat. it is only found in Honduras, Nicaragua, Costa Rica and western Panama at elevations from sea level to 700 m. It feeds at least in part on fruit. Also known as the satanic leaf-tailed gecko or the eyelash leaf-tailed gecko, is a species of gecko indigenous to the island of Madagascar. This type of gecko is smaller because of its shorter tail. 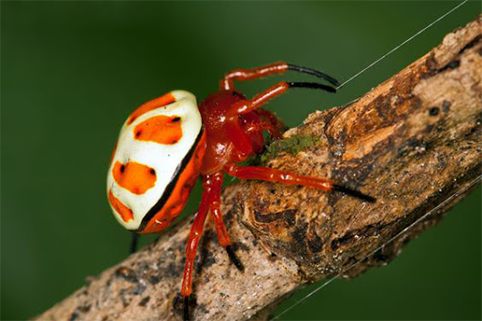 This spider is the only one of its kind. It is native to the Upper Amazon Basin in Ecuador, Peru, and Brazil. Yes, it's a spider, but isn't it adorable? 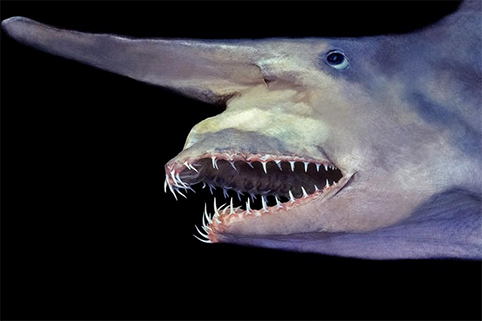 The goblin shark (Mitsukurina Owstoni) is a rare species of deep-sea shark. This pink-skinned animal has a distinctive profile with an elongated, flattened snout, and highly protrusible jaws containing prominent nail-like teeth. 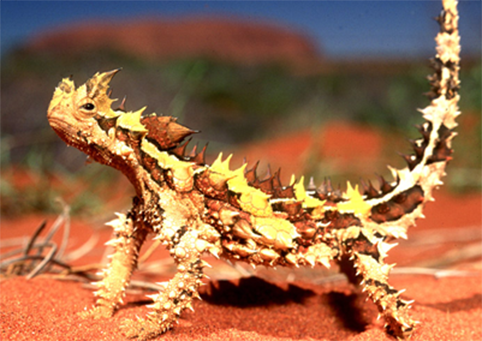 The thorny devil or thorny dragon is an Australian lizard, also known as the thorny lizard. Most are colored in camouflaging shades of desert browns and tans. These colors change during warm weather and cold weather. 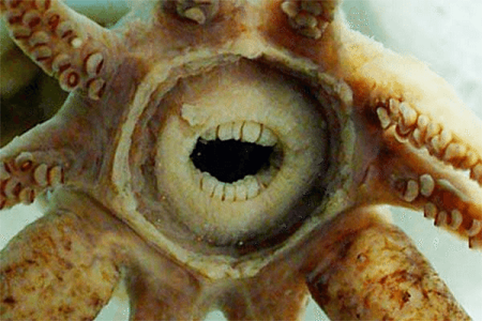 These animals are covered entirely with conical spines that are mostly uncalcified. This fish has a rounded, extensible body, and its soft skin is covered with irregularly-arranged dermal spinules resembling hairs. 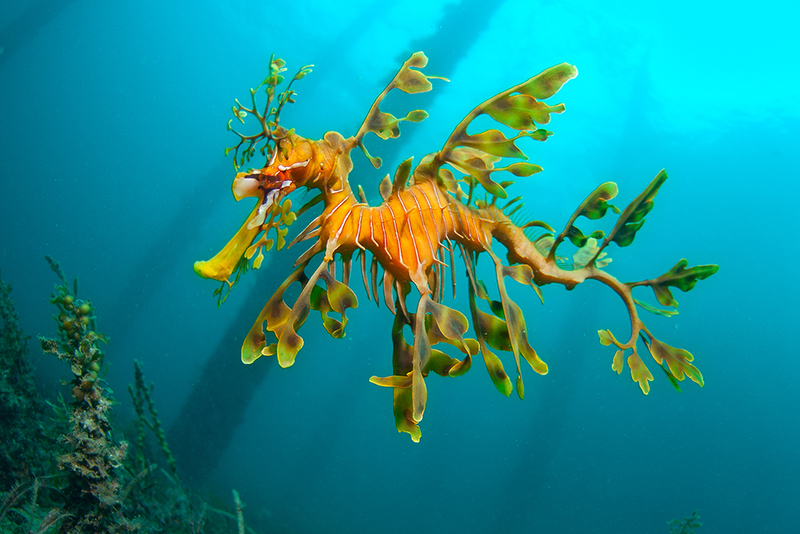 The coloring of its body is extremely variable, they tend to match their living environments. 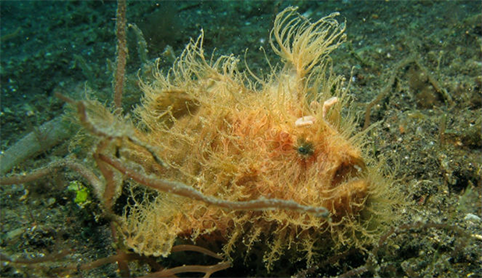 Frogfishes have the capacity to change coloration and pigment pattern, it takes only a few weeks. 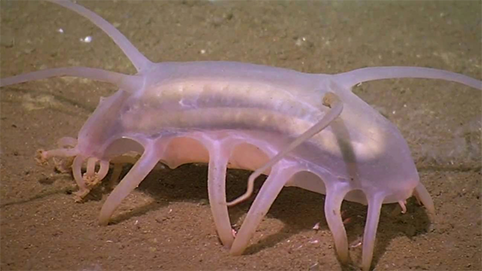 Sea pigs are sea cucumbers, a class of animals called echinoderms that also includes sea urchins and starfish. They live on deep ocean bottoms, specifically on the abyssal plain in the Atlantic, Pacific, and the Indian Ocean. 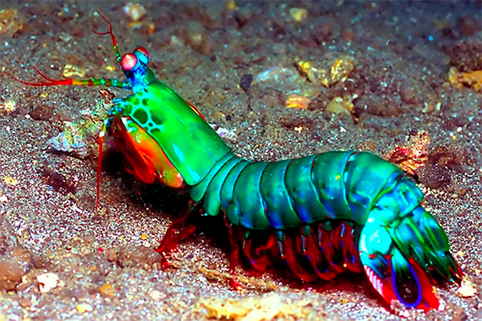 Also known as harlequin mantis shrimp, painted mantis shrimp, or clown mantis shrimp, the peacock mantis shrimp is a large mantis shrimp native to the Indo-Pacific from Guam to East Africa. The pygmy seahorses are found in Southeast Asia in the Coral Triangle area. 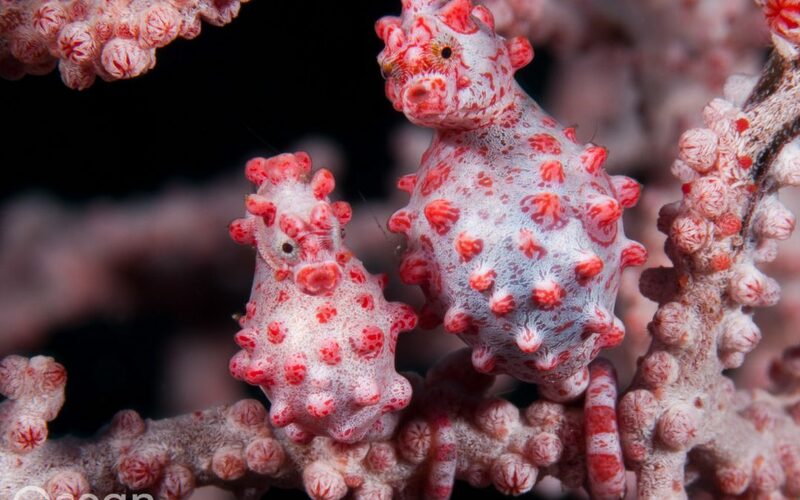 They are some of the smallest seahorse species in the world, typically measuring less than 2 centimeters (0.79 in) in height. 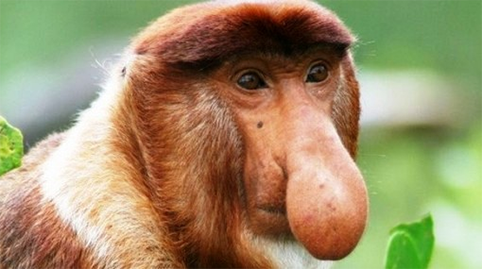 The proboscis monkey (Nasalis larvatus) or long-nosed monkey, is a reddish-brown arboreal Old World monkey with an unusually large nose. It is endemic to the southeast Asian island of Borneo. 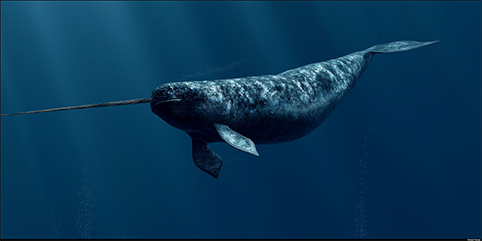 The narwhal (Monodon monoceros) is a medium-sized toothed whale that possesses a large "tusk" from a protruding canine tooth. It lives year-round in the Arctic waters around Greenland, Canada, and Russia. 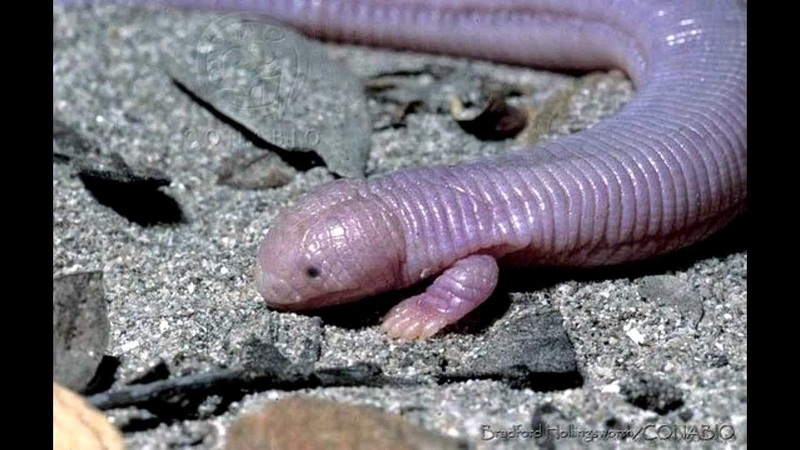 The Mexican mole lizard (Bipes Biporus), commonly known as the five-toed worm lizard, is a species of amphisbaenian, which is endemic to the Baja California Peninsula. It is one of four species of amphisbaenians that have legs. The leafy seadragon is found along the southern and western coasts of Australia. 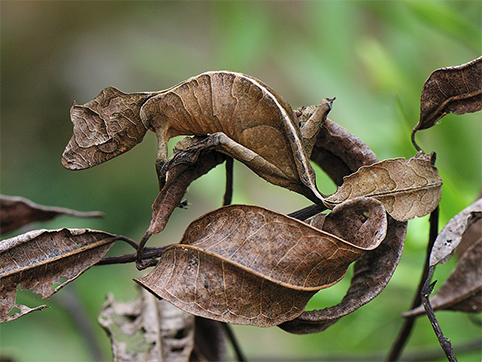 The name is derived from the appearance, with long leaf-like protrusions coming from all over the body. These protrusions are not used for propulsion; they serve only as camouflage. 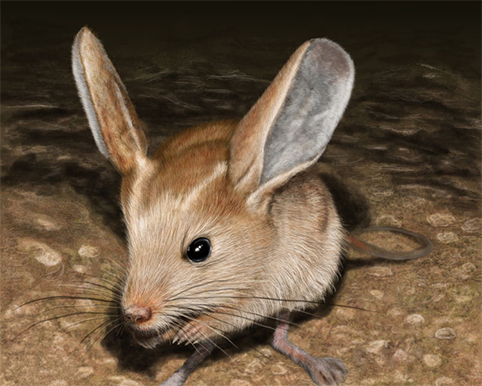 The long-eared jerboa (Euchoreutes naso) is a nocturnal mouse-like rodent with a long tail, long hind legs for jumping, and exceptionally large ears. Long-eared jerboas are found from southernmost Mongolia to the Takla-Makan Desert, Mengxin, Aerijin Mountain, and Qing-Zang Plateau regions of northwestern China. 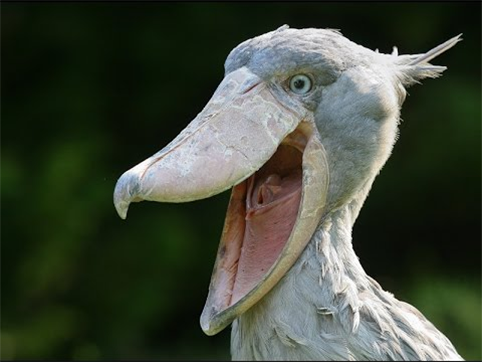 The shoebill (Balaeniceps rex) also known as shoe-billed stork, is a very large stork-like bird. 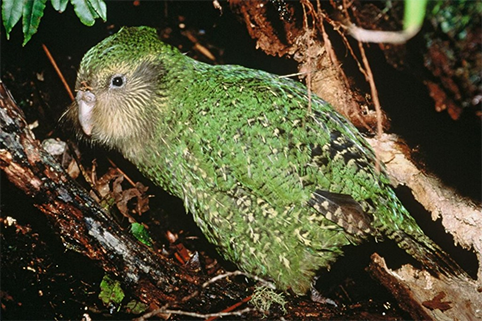 It derives its name from its massive shoe-shaped bill. The adult is mainly grey while the juveniles are browner. It lives in tropical east Africa in large swamps from Sudan to Zambia. The long-beaked echidnas live in New Guinea. Echidnas are one of the two types of mammals that lay eggs, the other being the platypus. 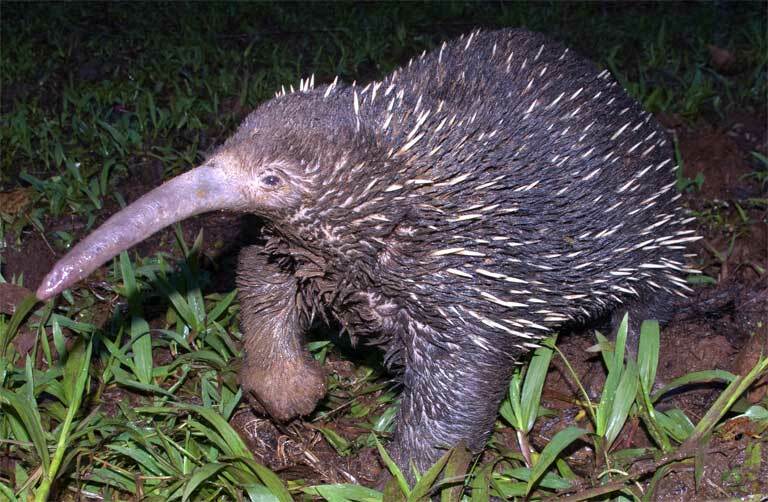 The echidnas retain reptilian features such as egg-laying but display mammalian features such as fur and lactation. 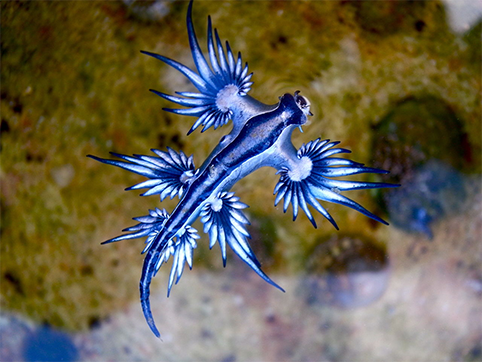 Glaucus atlanticus, also known as sea swallow, blue angel or blue dragon, is a species of small, blue sea slug. they float upside down by using the surface tension of the water to stay up, where they are carried along by the winds and ocean currents. The kakapo or night parrot is a species of large, flightless, nocturnal, ground-dwelling parrot endemic to New Zealand. It has finely blotched yellow-green plumage, a large grey beak, short legs, large feet, and wings and a tail of relatively short length. 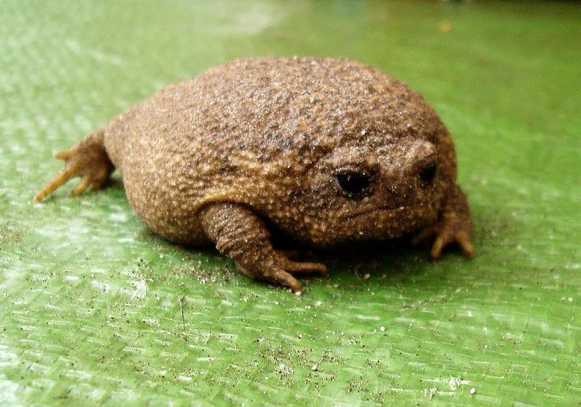 The cape rain frog or giant rain frog (Breviceps gibbosus) is a species of frog. It is the most common and largest of rain frogs.The species is endemic to South Africa. 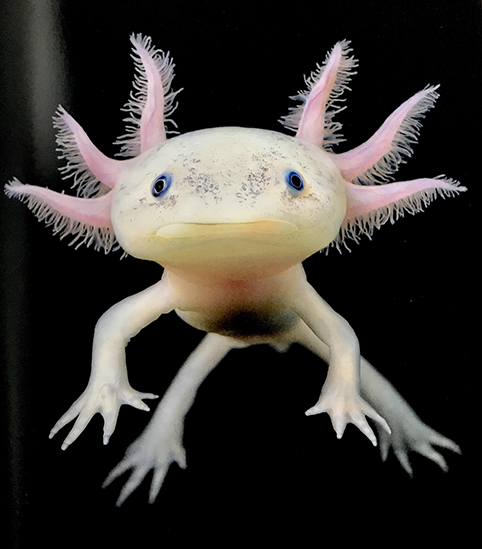 The axolotl, also known as a Mexican salamander, is a salamander, closely related to the tiger salamander. Although the axolotl is colloquially known as a "walking fish", it is not a fish, but an amphibian. The water opossum (Chironectes minimus), also locally known as the yapok is a semi-aquatic creature that is found in and near the freshwater streams and lakes in Mexico, Central, and South America to Argentina.It is the only living marsupial in which both sexes have a pouch. The Hispaniolan solenodon is found only on Hispaniola, the island shared by Haiti and the Dominican Republic.They are typically dusky brown over most of the body. The tail, legs, snout, and eyelids are hairless. 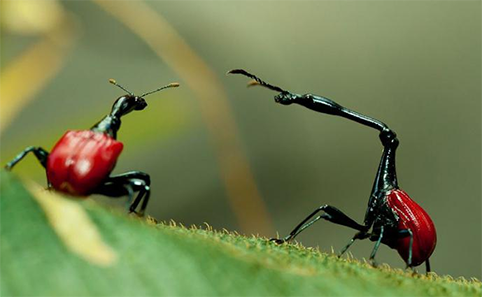 The giraffe weevil is endemic to Madagascar. It derives its name from an extended neck much like that of the common giraffe. Most of the body is black with distinctive red hardened forewing covering the flying wings. 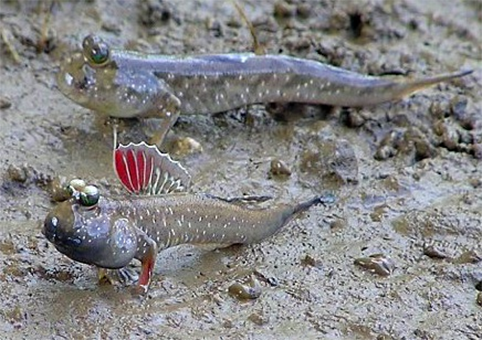 Mudskippers are amphibious fish. Mudskippers use their pectoral fins and pelvic fins to walk on land. Mudskippers are quite active when out of the water, feeding and interacting with one another. They are found in tropical, subtropical, and temperate regions, including the Indo-Pacific and the Atlantic coast of Africa. 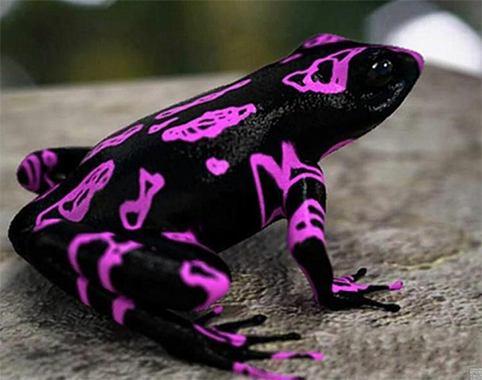 This species of atelopus frog was discovered in 2007 by scientists Paul Ouboter and Jan Mol. It can be found Central and South America. Unfortunately, the Atelopus Frog may be threatened by illegal gold mining. 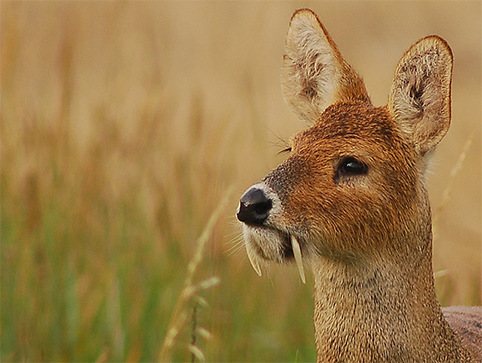 The water deer is native to China and Korea. There are two subspecies: the Chinese water deer and the Korean water deer. They lack antlers and possess a pair of prominent tusks. Promachoteuthis sulcus is a species of squid. It was captured accidentally by a research vessel in the vicinity of Tristan da Cunha, in the southern Atlantic Ocean.The creature gives the unique appearance of possessing human-type teeth. However, these are not actually teeth at all. Planthopper nymphs are a type of insect. In the time between hatching and becoming full-grown adults, they put on a flashy show. 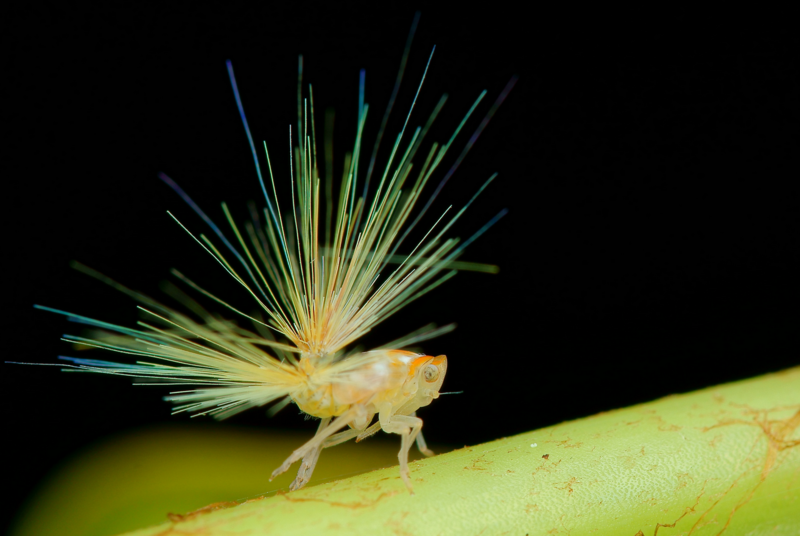 The planthoppers can secrete a waxy substance from their abdomen that results in strange, fiber optic-like tails. 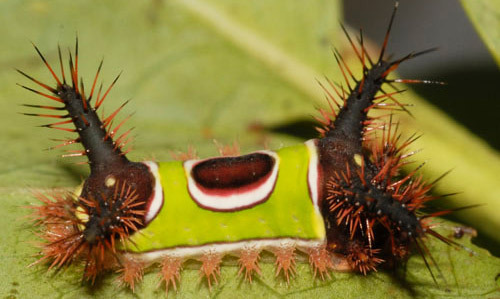 The saddleback caterpillar is the larva of a species of moth native to eastern North America. It is also found in Mexico and Central America and possibly in the northern part of South America. Most of the body bear urticating hairs that secrete an irritating venom. Pinocchio frog is the informal name for a tree frog. It was discovered in the Foja Mountains of Papua, Indonesia during a 2008 expedition. 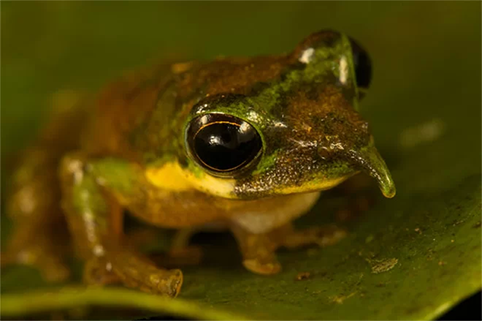 The frog is named for its Pinocchio-like nose. 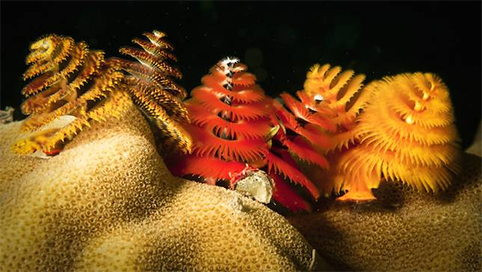 Spirobranchus giganteus, commonly known as Christmas tree worms, are tube-building worms. The worms' most distinct features are two "crowns" shaped like Christmas trees. Each spiral is composed of feather-like tentacles that cause any prey trapped in them to be transported to the worm's mouth. 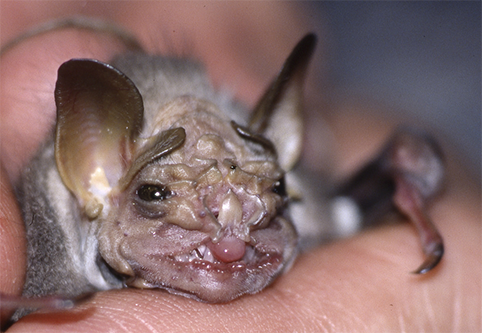 Tube-nosed Bats are a unique and fascinating Australian Fruit Bat species. They have huge eyes, spotted wings, and tubular nostrils. They are a deep brown with gray heads and sparse yellow spotting. 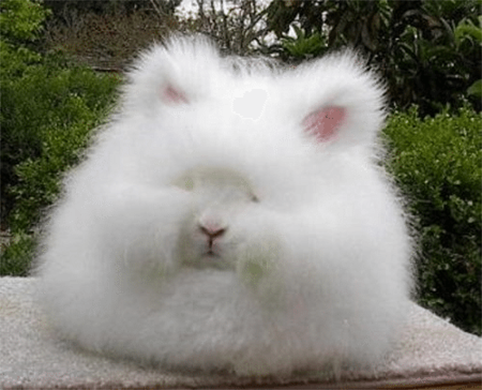 The Angora rabbit is bred for the long fibers of its coat, known as Angora wool, that are gathered by shearing, combing, or plucking. Because rabbits do not possess the same allergy-causing qualities as many other animals, their wool is an important alternative. 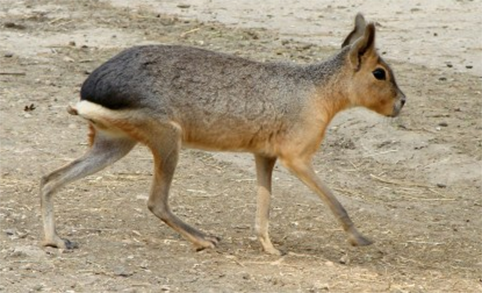 The Patagonian mara (Dolichotis patagonum) is a relatively large rodent. 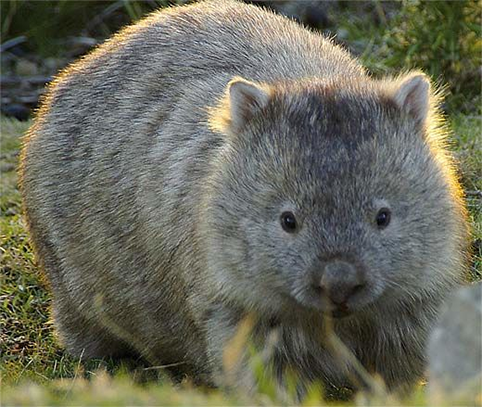 It is also known as the Patagonian cavy, Patagonian hare or dillaby. This herbivorous, somewhat rabbit-like animal is found in open and semi-open habitats in Argentina, including large parts of Patagonia. The pigbutt worm or flying buttocks is a species of worm. 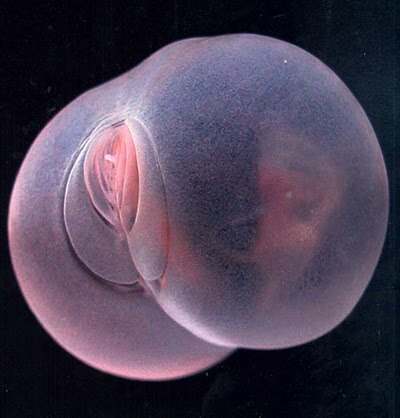 The worm is round in shape, approximately 10 to 20 millimeters in length (roughly the size of a hazelnut), and bears a strong resemblance to a disembodied pair of buttocks. 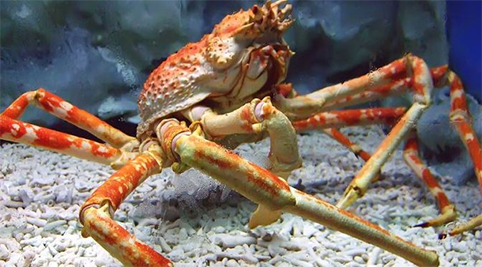 The Japanese spider crab s a species of marine crab that lives in the waters around Japan. It has the largest leg span of any arthropod. The crab is orange, with white spots along the legs. 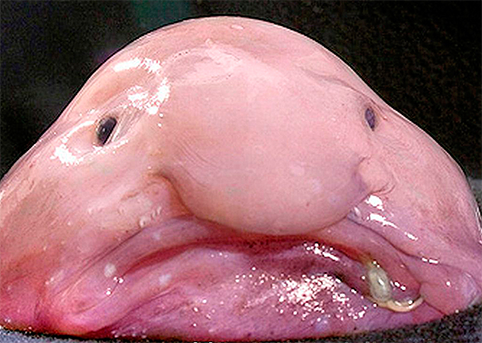 The blobfish is a deep-sea fish. It inhabits the deep waters off the coasts of mainland Australia and Tasmania, as well as the waters of New Zealand. The flesh of the blobfish is primarily a gelatinous mass with a density slightly less than water. The Chinese giant salamander (Andrias davidianus) is the largest salamander and largest amphibian in the world, reaching a length of 180 cm (5.9 ft). It is fully aquatic and is endemic to rocky mountain streams and lakes in China. The red-lipped batfish or Galapagos batfish is a fish found around the Galapagos Islands and off Peru. 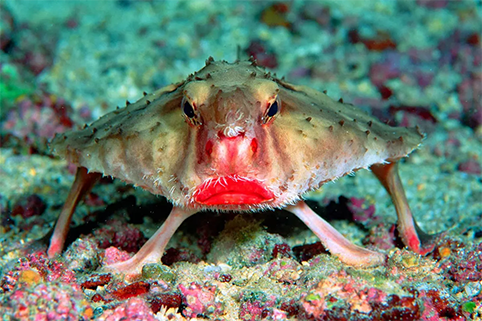 This fish is mainly known for its bright red lips. Batfish are not good swimmers; they use their highly adapted pectoral fins to "walk" on the ocean floor. 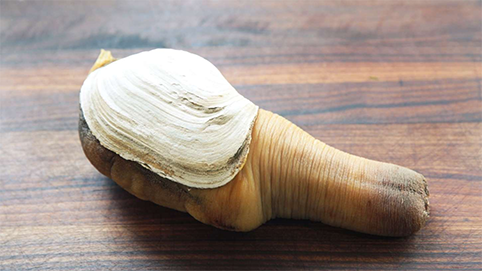 The Pacific geoduck is a species of very large, edible saltwater clam. The geoduck is native to the coastal waters of western Canada and the northwest United States. The geoduck is the largest burrowing clam in the world. The bald uakari or bald-headed uakari is a small New World monkey characterized by a very short tail; bright, crimson face; a bald head; and long coat. 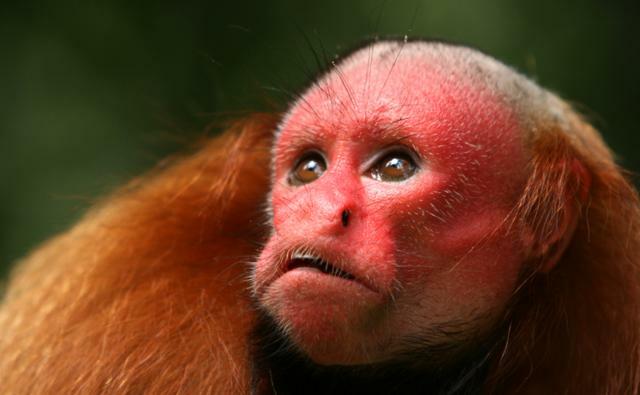 The bald uakari is restricted to várzea forests and other wooded habitats near water in the western Amazon of Brazil and Peru. 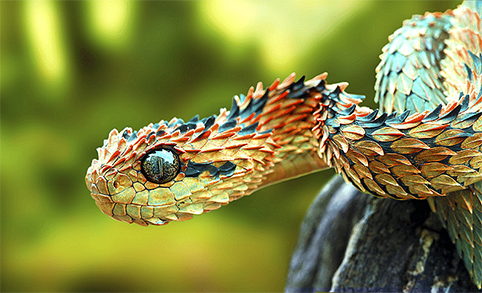 The spiny bush viper or Atheris hispida is a venomous viper species endemic to Central Africa. It is known for its extremely keeled dorsal scales that give it a bristly appearance. 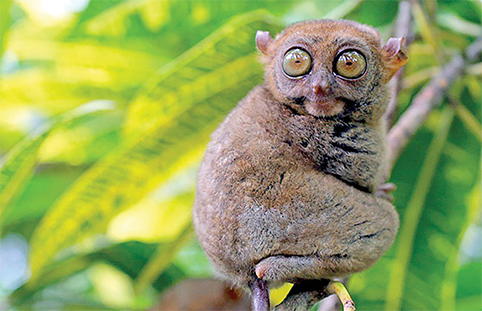 Tarsiers are small animals with enormous eyes; each eyeball is approximately 16 mm in diameter and is as large as, or in some cases larger than, its entire brain. Although the group was once more widespread, all its species living today are found in the islands of Southeast Asia. The hooded seal is found only in the central and western North Atlantic, ranging from Svalbard in the east to the Gulf of St. Lawrence in the west. 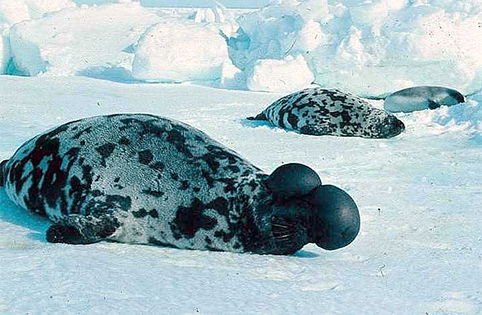 The seals are typically silver-grey or white in color, with black spots that vary in size covering most of the body. 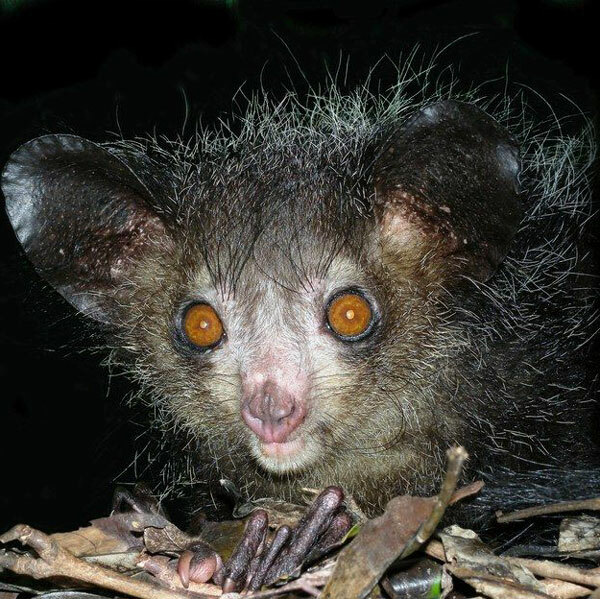 The aye-aye is a lemur native to Madagascar that combines rodent-like teeth that perpetually grow and a special thin middle finger. It is the world's largest nocturnal primate.It is currently classified as Endangered.